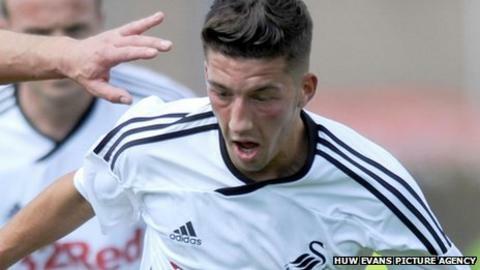 Swansea City midfielder Lee Lucas has joined League Two side Burton Albion on loan until the end of the season. The 19-year-old, who has a contract at the Liberty Stadium until 201, is a regular in the Wales Under-21 squad, winning nine caps and scoring once. "I'm really looking forward to it. I can't wait to play some games and gain some more experience," said Lucas. Meanwhile the Brewers have also extended midfielder Andres Gurrieri's deal until the end of the season. Gurrieri has made nine appearances for Burton Albion since joining in October, including two starts. Lucas was handed his Championship debut last season under manager Brendan Rodgers as a second-half substitute in the 4-0 win over Sheffield United at the Liberty in the final game of the promotion-winning campaign. The Aberdare product, who joined the Swans at the age of nine, added: "I had a taste of League football last season against Sheffield United. I really enjoyed it and it spurred me on for more. "The manager [Brendan Rodgers] called me into his office and told me about the possibility of going out on loan. "He said it was a good opportunity for me, especially as Burton try to play the game the right way and are in with a chance of promotion. "Hopefully I can help them achieve that goal. I had no hesitation in accepting the opportunity because I've been hoping to go out on loan for a while. "The new reserve league has been good for me this season, but I felt I needed to take the next step." Burton manager Paul Peschisolido added: "He's a lad we've watched a few times and he's been in and around Swansea's first team. "He's got a great range of everything. I don't want to get too carried away because he's a 19-year-old boy, but what we have to do is get him on the ball. "Swansea have players who are comfortable on the ball and that's how I want us to play."